The governing partners of Benjamin Netanyahu’s ruling coalition voted unanimously on Monday to dissolve the Knesset. Israeli Prime Minister Benjamin Netanyahu speaks at the Israeli Knesset on Jan. 16, 2017. Credit: Yonatan Sindel/Flash90. New elections are tentatively scheduled for April 9, 2019, four years since the last election, and six months before the previously scheduled election date of Nov. 5, 2017. “In the name of budgetary and national responsibility, party leaders in the coalition agreed unanimously to dissolve the Knesset and go to new elections at the beginning of April, following a full four-year term,” said a government spokesperson on behalf of the governing parties. The decision came during a five-hour meeting in the Prime Minister’s Office between leaders of the coalition’s five parties. The party leaders recognized that the narrow 61-member parliamentary majority did not have the staying power to pass key legislation, including a bill aimed at increasing the number of Orthodox Israeli citizens serving in the military. The Haredi Draft Law, as it is called would impose financial sanctions on religious learning institutions which failed to meet enlistment quotas, while simultaneously enabling those who have already selected to defer their military to service to extend their deferments. Religious parties in the coalition refused to back the legislation. Israel’s Supreme Court had given the government a Jan. 15, 2019 deadline to pass legislation increasing the number of Orthodox draftees. 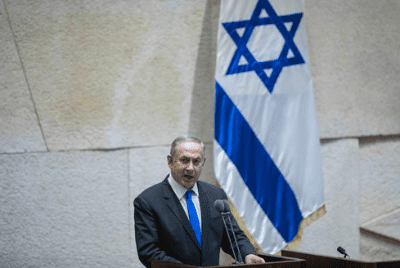 Netanyahu had hoped to enlist the support of parties outside the coalition to support the bill, but when it became clear that the government would not garner the parliamentary support necessary from the opposition, new elections were announced. The coalition parties announced that they would all remain in the government until the new election date and would attempt to cooperate on other legislative issues. The average Israeli government historically remains intact for 3.8 years. Rarely do governments last an entire term, due to Israel’s complex parliamentary system. Previous elections were held on March 17, 2015. Lets hope the Labour party in Israel wins.